As I mentioned in my review of The Rook, the first installment in Daniel O'Malley's Rook Files, these books have been optioned for TV by Twilight author Stephenie Meyer. 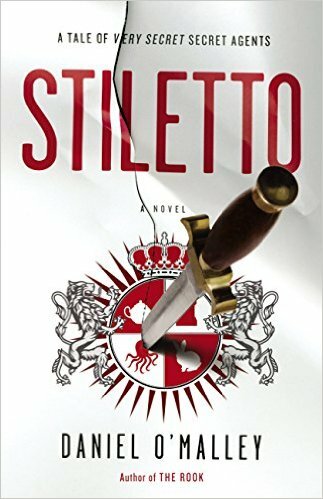 Now that I've read the second book in the series, Stiletto, I am even more impressed by Ms. Meyer's foresight, because if they get this series even halfway right she is about to make piles of money. Stiletto opens shortly after the events of The Rook. The Checquy (a covert British organization charged with protecting society from supernatural threats) is reluctantly contemplating an alliance with the Grafters (one of the aforementioned supernatural threats). The two groups have feared and loathed one another for centuries, but Checquy operative Myfanwy Thomas has flexed every ounce of her considerable willpower to broker peace talks between them. Unfortunately, inexplicable attacks have been occurring all over London, and the bad blood between the Checquy and the Grafters leaves them more mutually suspicious than cooperative. The Rook is like a Jasper Fforde-penned mash-up of Penny Dreadful, Orphan Black, and The Office. Stiletto offers more of the same cheery, bone-deep weirdness, but with an expanded cast, even more action sequences, and 100 additional pages. I am no longer chagrined that it took O'Malley four years to produce a sequel; considering the scope of Stiletto I'm actually impressed he got it out as fast as he did. Of course, that means the next book in the Rook Files is probably years away, but if O'Malley continues to deliver such memorable and satisfying individual installments I am more than willing to wait.